The nail as it appeared in 1911. From Fox's dissertation. 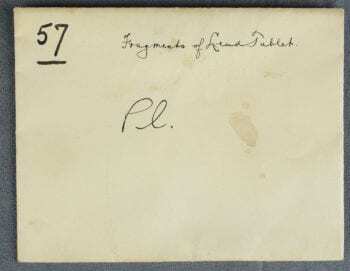 One of Fox's envelopes. "PL" stands for "Plotius". As part of his research, Fox numbered each of the larger fragments individually (his India ink inscriptions are still visible on the fragments that comprise the Plotius text) and began to separate them based on color and condition of the metal, and the style of writing. 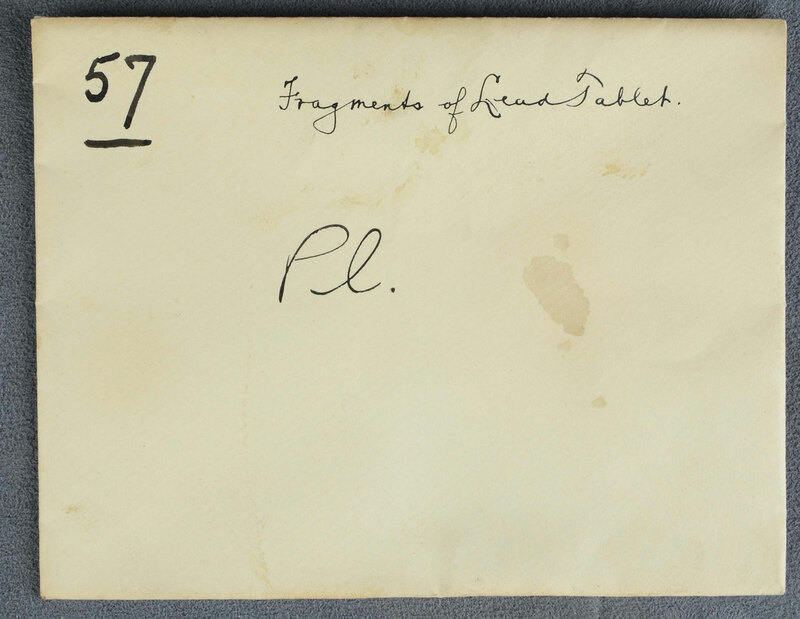 He labeled 210 “working” fragments and placed them in individual envelopes (such as the one on the right). Fox then made exact copies of the fragments on cards, allowing him to reconstruct an alphabet key for the Latin used in the texts that helped him decipher the words on each fragment. Fox determined that there were five distinct texts mentioning people to be cursed including Plotius, Aquillia, Avonia, Secunda and Vesonia. Only after deciphering the “working” fragments could Fox create a drawing of the extant texts. Plotius is one of the most complete tablets, though the center of the tablet which was pierced with the iron nail is almost entirely missing. Click here to see Fox’s reconstruction and transcription of the Plotius text. Of the five curse tablets published by William S. Fox in 1908, the tablet related to Plotius was the most intact. 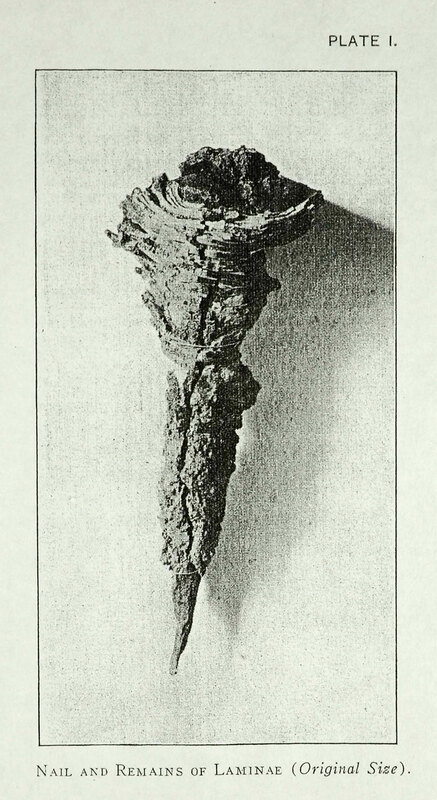 Fox worked with chemists to try and release some of the lead fragments from the iron nail, but attempts cleaning with sulfuric acid were fruitless and rendered the fragile lead even more brittle and unworkable. Some fragments were so obscured by white corrosion products that Fox again enlisted the help of chemists to clean them with a dilute nitric acid to reveal the text. Despite Fox’s efforts, the tablets were in such poor condition that he could not physically reconstruct them any further. Instead he chose to transcribe the text and leave the fragments in their envelopes.